Hulu on Reddit this week announced that it will begin rolling out support for 60 frames per second live streams on its "Hulu With Live TV" cord-cutting service, launching in time for viewers to stream the Olympics and March Madness. Hulu said it was aware that 60fps streaming was "one of the most-requested features" by its viewers, leading to this week's announcement (via Cord Cutters News). The company explained that the update will see a launch in phases, and began yesterday with Phase 1, including the following channels now supporting 60fps on Hulu With Live TV: CNN, CNN International, HLN, TNT, TBS, TCM, TruTV, Cartoon Network, Adult Swim, all SHOWTIME channels, "about half" of available FOX affiliates, all NBC affiliates, and New England Channel News. Hulu noted that individual affiliates "may temporarily revert back" to 30fps streams when adjusting for internet speeds, giving viewers a more stable experience. Phase 1 will include Hulu apps on iPhone, iPad, Apple TV, Xbox One, Fire TV, Samsung Tizen TV, and Nintendo Switch. The company hasn't yet indicated when Phase 2 will begin, or what channels/devices will be part of that rollout. 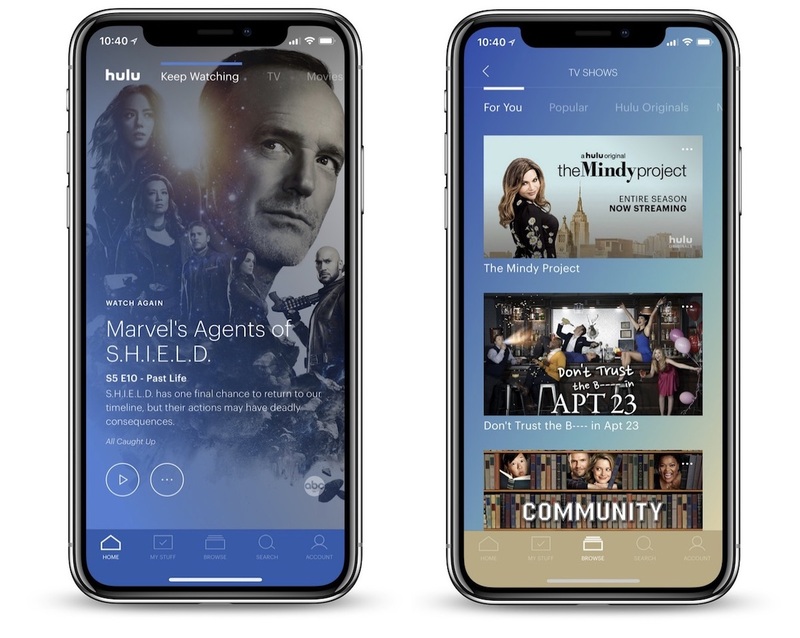 Later this year, Hulu will also be launching a redesigned user interface across its on-demand and live services, including a new Live TV guide. For the Live TV section of Hulu, the latest numbers put the service at 450,000 paid subscribers, beating out YouTube TV (300,000), but still trailing DirecTV Now (1 million) and Sling TV (nearly 2 million). Video quality is ultimately why I landed on using Hulu for most everything. I tried DirectTV Now and the CBS app subscriptions... both had garbage video quality (overly compressed, jittery). Hulu knows how to get it done. Can't wait for them to start streaming some shows / channels in 4k! This is all marketing ********. The only 60fps content available is Billy Lynn’s Halftime Walk, a movie shot in that format. All other content is shot at 24fps. Video games can pump out 60 locally. Which leaves live sporting events which would be a new thing if they even have all the hardware set up to do it. Forget news in 60fps. Not happening. CNN would have to upgrade every camera and switcher in the signal path. HDR and 4K would be a far more meaningful upgrade. Perhaps someone that knows more about this can answer - is over the air TV broadcast in 60fps? Or, can it be? Mostly for Live TV, yes. Live Shows like SNL for instance, Live News, Sports and soap operas are all shot in 60fps and aired in 60fps. Thankfully most News and Live TV Shows have been shot and aired in 60fps for quite some time now. No hardware upgrades needed. Hulu just needs to upgrade their stream quality to match what has already been airing on Live TV for years. I have the same question, will the actual broadcasts be in 60fps? Which makes me still wonder, are we actually getting 60fps from camera all the way to tv with this hulu update? I wish not only sports or live, but everything would stream at this framerate. Just as most 4K movies just has been upscaled, they could pre render frame interpolation to deliver smoother playback. This would actually serve no purpose, unless your TV/decoder just does a really poor job of matching the source content to its native display refresh rate. The vast majority of scripted programming was originally shot at 24fps, so converting this content to 60fps would mean that frames need to be repeated. Now, this is a very typical procedure done in broadcast today for sure, but this is purely for matching the source to the broadcast standard in play for that channel. This is not done to 'benefit' the video. And as most people have already commented on wrt UHD Blu-ray, when a film that was mastered for disc at 2K and scaled to 4K for the UHD disc, the video quality here is far inferior to films that were natively mastered at 4K. Correct about Billy Lynn being the only major Hollywood Studio release of a film natively shot and distributed at 60fps. But for non-Hollywood content, especially sports, this has been going on for years. You would be very hard-pressed to find any sporting event in North America on broadcast TV shot at 24fps. They are shot and produced at either 720p60 or 1080i60, depending on the network. Exactly my thought. As a secondary matter - is Hulu upconverting the signal, or is Hulu getting a better feed than what everyone else gets OTA. As I understand it, the OTA signal can be 60hz 720i, or 30hz 1080i (and obviously some are 30hz 720i at half the bandwidth). But I don't know whether any actually transmit at 60hz. Hulu is getting the same signal your local station relay and satellite or cable provider receives. Again, all broadcast tv is 60Hz. Hulu is just now deciding to deliver to their customers the native 60fps of the 720p channels, and likely separating the fields of the native 1080i channels into sequential frames, which results in the same net effect of 60 fps. I'm no expert- and did NOT stay at a Holiday Inn last night- but best I know, the answer is NO. I suspect they are taking the 30fps interlaced signals and creating a 60fps progressive signal from it. I haven't seen anything that says these networks are delivering content shot at 60fps. This is sort of correct. Again, I wouldn't term it as fps, as that does video broadcasting standards a disservice due to interlacing. Hulu is most likely taking the 60i ('30fps') interlaced source and separating the fields into a 60p version of the source to feed into their encoder (this is all likely done within the encoder, but I'm just splitting it out here so that it may be easier to visualize). For native 60fps content, of which about 30% of the channels in NTSC land are, Hulu is just maintaining the input. Side by side, they appear similar in terms of smooth motion, motion blur, etc. So, referring these web channels as 60FPS seems appropriate . This is a pretty accurate readout actually. Both 1080i and 1080p60 actually have the same number of fields, so on a good tv with a good preprocessing engine, the difference between 1080i and and 1080p would not be too much. The 1080p version should look much sharper, due to it having twice the effective vertical resolution, but the motion itself wouldn't be too much different. If they are “upconverting” 30 fps to 60fps wouldn’t that cause shows to have a weird “filmlook” effect? Correct, but this is not what they are doing. There are two main methods to convert video from one lower frame rate to a higher one. The first is called interpolation, and this is what most TVs do when you enable their 'smooth motion' process or whatever they choose to call it. The net effect of this is that 'soap opera' effect you allude to. The second option is call pulldown or telecine. In this method, frames or fields are repeated. The net effect of this is judder. This is no doubt something that everyone is used to as it is the standard used by broadcasters to convert 24fps content to their native broadcast signal. No. "Upconverting" 1080i 30fps to 1080p 60fps just doubles the frames. the 60fps version tends to look/play better on non-interlaced devices like computer and mobile screens and modern TVs that are basically more computer screens than traditional TV screens. BUT, broadcasters are still married to 1080i because that is the HD broadcast standard. Your TV or STB receives a 1080i signal and dynamically doubles the frames to feed a TV capable of 60fps. Real 1080p60fps would actually have changing information on up to each of those 60 fps. This is why it's desirable to in-the-know sports fans because it allows fast-moving sports to have less blur-judder-jumpiness. Doubling 30fps to 60fps doesn't do that. But if this is getting stuff shot at 60fps and delivered at 60fps, it may make a noticeable difference- especially in fast-moving scenes (sports, action movies, etc). The "film look" issue is typically working with film sources rendered at 24fps and converting it to 30fps. That is not just doubling the frames but a actually involves a bit of complication. The other "film look" is the other way- the desire to see 24fps at 24fps but not having such an option via :apple:TV until recent software updates. This: https://www.cnet.com/how-to/1080i-and-1080p-are-the-same-resolution/ actually does a pretty good job talking to all of these topics, though I don't quite buy the final conclusion in that last line. Again, another misconception here about what a TV is doing. If the TV were just taking in a 1080i signal and doubling the frames to 60fps, this would look exactly like how OTT sports that are encoded at 30fps would look. This is because NO TV has a native refresh rate of 30Hz. What the TV is actually doing is similar to what I describe Hulu is probably doing, which is separating each field in an interlaced channel and laying them out sequentially to maintain all of the original source motion resolution. This method does require a vertical scale, but the TV has to do that too in order to size the source for its own native resolution. To test this, you can go ahead and tune to a 1080i channel and point a camera at it that can record at 60fps (even an iPhone these days would suffice). Then view the recorded file frame-by-frame. You will see that all frames on your TV's display are unique (of course, the content has to be something like sports, and not the latest episode of NCIS or such). I delivery broadcast television, I can tell you for a fact that it isn’t. In North America most content is sent to broadcast as 29.97 frames per second (technically interlaced 59.94 but it displays back as 29.97). So basically this is a gimmick at best. Even broadcasting at 29.97 most Footage is shot at 23.98 so they can play it back at whatever they want but it won’t change the look any because it wasn’t shot with that many frames. The only time 60 FPS makes a difference is when you are talking Footage that’s created at 60 such as video game footage and maybe some sports, I’m not sure what they shoot at. Content created under won’t see any benefit to a higher frame rate. The split for HD broadcast in NTSC-land is around 70-30% for 1080i vs 720p. But to think of video in terms of fps (and really someone in delivery broadcast television should know this) is not correct. Almost all video broadcast by standard non-PPV channels are broadcast at 60Hz. For 720p60 on a standard 60Hz TV, this is easy to understand how each frame is displayed. For 1080i60 on a 60Hz TV, this should also be relatively easy to understand how each field is displayed, especially given my above descriptions. I do not think you could find a TV that would just discard the non-dominant field of an interlaced signal and actually only display 30fps (maybe if you go back a few years to the first 4K 'TVs' that only supported 4K @ 30Hz, then this may be an example, but those were rare and really more akin to monitors than true TVs anyway). So in short (lol I know by now if you're still with me), this is most definitely NOT just a gimmick. For any non-sports, non-news, or non-reality-tv programming (i.e. all film-based original content), then this announcement indeed has little value. But if you want to watch events like the Olympics, the World Cup, the NCAA basketball playoff, or the Super Bowl on one of these streaming services on your TV and not feel like you're watching a pirated stream, then this is fantastic news and ushers in a new era for more competitive video quality on these streaming services (and yes, I know, Hulu is a bit late to the game here so I am not just talking about them). So this is going to require more bandwidth? Because my last experience with Hulu was constant buffering issues on my 100mbps connection. I am skeptical that customers would make this "one of the most requested features." I wonder if the general customer could even tell a difference and/or know that such an option even exists to ask for it. On the other hand, people have been building home theater surround sound systems in their homes since way back into the 1990s or so. In cutting the cord, they must notice that they no longer get 5.1 surround from all the television that used to play it when they had cable or satt. Guessing- perhaps just wildly here- I would guess more consumers might notice that and request that vs. 60fps video. And weirdly, I wonder why none of the streamers are passing through 5.1 anyway. It would be a huge point of competitive differentiation to be the ONLY streamer offering 5.1 audio... and significantly close a big hole is the migration away from cable or satt. Sure, I realize that not everyone knows about, is equipped for or cares about 5.1, but in some debate about consumer demand of 60fps vs. 5.1, I would (wildly) guess that consumers might be more aware that they are missing 5.1 than they are about 60fps. Maybe some Hulu survey where they word 60fps as some big advance and just leave off any option to mark 5.1 surround? Then, they can say: "you asked for it, you got it"??? Another site builds on this story by talking about "for sports fans" and 60fps would certainly be beneficial for watching fast-moving sports. Another ties this into seeing Olympic sports in 60fps and again that would be a benefit. But with sports too, sports fans are - presumably- more likely to have long since set up some 5.1 surround to feel like they are there. I would think sport fans asking for 60fps would be at least as likely to be asking for 5.1 surround too. Faux surround via stereo is far from the same. Lastly, the Olympics tie-in is obvious. Our friends across the Pacific will be seeing some of the Olympics in 4K and 8K ('https://www.whathifi.com/news/winter-olympics-to-showcase-first-8k-hdr-broadcasts'). Conceptually, a streaming service could at least roll out a 4K Olympics easier than most any other source. Wouldn't it be great if someone did... at least as an option?